to talk books and writing. Author/publisher interviews and book reviews. Silvio Sirias is the author of Bernardo and the Virgin (2005) and Meet Me under the Ceiba (2009), winner of the Chicano/Latino Literary Prize for Best Novel, and most recently The Saint of Santa Fe. A native of Los Angeles, he spent his adolescence in Nicaragua and currently lives in Panama. 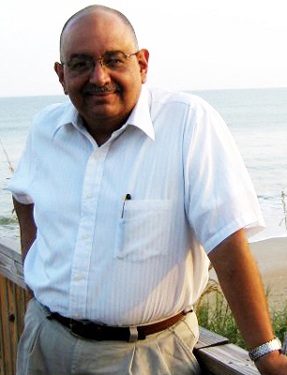 In 2010, Silvio was named one of the “Top Ten New Latino Authors to Watch (and Read).” He has a doctorate in Spanish from the University of Arizona. He has also published academic books on Julia Alvarez, Rudolfo Anaya, and the poet Salomon de la Selva. In addition, he has a collection of essays titled Love Made Visible: Reflections on Writing, Teaching, and Other Distractions. The Routledge Companion to Latino/a Literature lists him among the handful of authors who are introducing Central American themes into the U.S. literary landscape. For more information, visit his website at www.silviosirias.com. Q: What’s inside the mind of an author who writes fiction set in Central America? A: Central America is full of wondrous stories with universal appeal. My novels are an attempt to take English-speaking readers into this magical, wondrous, yet sometimes tragic world. Q: Tell us why readers should buy The Saint of Santa Fe. A: During the 1970s and 1980s, thirty priests gave their lives in an effort to bring social justice to a region that was plagued by military dictatorships. The most famous case is that of the Salvadoran Archbishop Oscar Arnulfo Romero. The Saint of Santa Fe tells the story of the first priest to die, Father Hector Gallego, in Panama. His life and sacrifice is remarkable and they continue to inspire Panamanians today. Q: What makes a good novel? A: One that tells a story that penetrates the human heart. A: I rise early, exercise to get the blood flowing and become fully awake, read the news that interests me, set up my writing area, and I begin by revising what I have written the day before. This helps my mind get back into my fictional world. Then, with the help of an outline, I plough ahead. I write until my ideas no longer seem fresh—which is usually around three in the afternoon. Afterwards, I do a few chores around the house before I settle down to watch a movie or an episode from my favorite television show at the time. A: Hearing from readers who have been touched by something I created. Nothing beats the feeling that I’ve created something worth a reader sacrificing his or her leisure time.